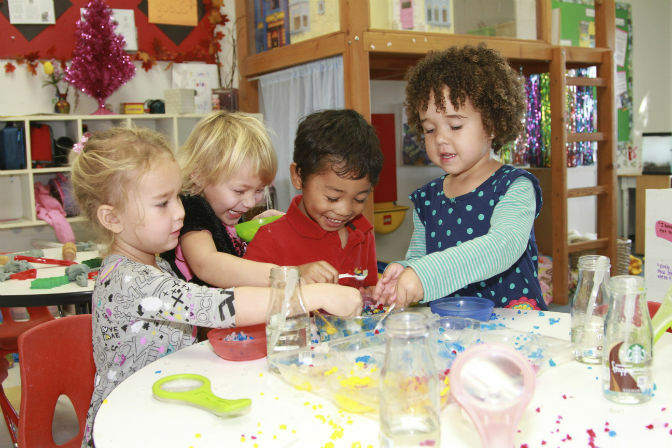 All Pre/K classrooms are set-up with unique learning centers that encourage children to be self-sufficient while fostering an understanding of basic concepts. Our child-centered room arrangement allows children to move freely from one interest center to the next, giving them the opportunity to make plans and choices in their environment. Every day we gather together and share stories, talk about our day and plan our learning journey. Being together allows us to get to know our friends, sing songs and play learning games. We assign helpers for the day, give a weather report and take a look at our calendar. We love a great book! Each day we set aside time to read together. Our read-alouds encourage us to be readers as we read simple, repetitive stories with predictable text. We also learn about different authors, illustrators and different types of stories.